The SEBILE Pro-Shad Spinnerbait is the result of combining years of fishing experience and research with innovative thinking - and it shows. The Pro-Shad Spinnerbait was voted the Best Metal Lure of 2010 at EFTTEX in Valencia, Spain.It comes in two series - Trophy and Finesse. One big thing which is common between the two is that the blade or blades are not directly on the same wire that stems from the head of the spinnerbait. On a standard spinnerbait, a single fixed piece of wire usually looms more or less over the hook point, meaning that a fish that engulfs the entire lure may not always get hooked because the upper arm may block or prevent the hookset. 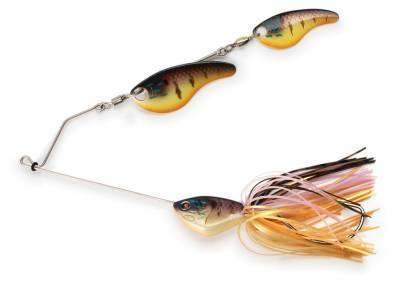 In comparison, both models of the Pro-Shad Spinnerbait have their blades mounted on an independent piece of wire which has a junctured link to the main wire. This means that if a fish engulfs the wire along with the bait now, it is designed to move out of the way and there is nothing to foul up a good hookset every time!Another benefit of the junctured arm is its freedom of movement will always let the blades operate at the right angle and the right position to keep spinning all the time. That is a very important and key design goal to always have constant swimming action from the blades. After all, the blades are the most important part of a spinnerbait. If you don't believe it, experiment trying to catch anything on a spinnerbait with the blades removed or with the blades so they can't turn, and you'll see it's true when we say "blades make the spinnerbait" and the more freedom with which the blades turn, the more fish you'll entice. That's why Patrick Sebile dedicated much time and effort to design the perfect SEBILE Pro-Shad Blade which is wide in front and narrow in the back, allowing the blade to work under any speed, from ultra slow to ultra fast, with a fair resistance but lots of turbulences, and it gives a very realistic lifelike flash and silhouette to the lure. But that's not all. The junctured arm then gives the maximum - almost 360 degree freedom for the spinning blades to follow perfectly every angle of the retrieve or on the fall.You'll never look at a standard spinnerbait quite the same again, with its fixed arm that often causes the front blade especially to not really work at all or just flicker weakly without enough freedom to even loop over the top of the wire.The body is made of bismuth encased within hard plastic. That permits the body to have the most realistic finishes with lifelike details such as scales, eyes and gill flaps that rival any crankbait.Uniquely designed with a wide-gap for an increased hookset ratio and better holding power, the high-quality black nickel hook has a super hard sharpened point. This special wide gap hook is designed with the goal to really increase the distance behind the upper lip where the hook sets when a fish bites, and especially when a large fish swallows the whole thing, this wide gap is what you want (compared to traditional round, deep bend spinnerbait hooks) first for the hookset further behind the lip, and second to hold very well during the fish's head-shaking fight, the offset wide gap hook is superior. Whereas the Finesse model has two blades on its arm, you will immediately notice that the Pro-Shad Spinnerbait Trophy model only has one blade and what's very unique is that behind the blade there is a skirt that is moved by the turbulences that the spinning blade creates and that in turn gives the skirt a spiraling movement too. The skirt acts in swirling motions giving the illusion of extra volume to make big fish think this is a substantial prey! But the extra volume isn't entirely an illusion either. The spiraling skirt pushes a HUGE volume of water in every direction, creating a monstrous trail of turbulence that works as well on the retrieve as on the drop. If you use some kind of yo-yo or reeling slower/faster or even on a dead drop, the skirt spirals and emits a ton of turbulence no matter how you use the Pro-Shad Trophy spinnerbait!Some people may wonder if fish will try to hit the blade and skirt behind it, since it is a bulky target, but the Trophy model is really a big lure dedicated to catching big fish and those trophies usually only have one goal in mind - which is to swallow the whole thing!The Trophy model features an extra heavy duty wireframe and a welded shut line tie eye for attaching a snap and wire leader as appropriate for toothy gamefish.Also note that SEBILE has produced a new Dressed Trailer Hook in 1/0, 3/0 and 5/0 sizes for 2011. With a wider gap than a normal trailer hook, it holds better in the fish's mouth. The point sits at a level slightly above the primary lure's hook point. Strong and super sharp, the hard black nickel finish is durable and corrosion-resistant in both fresh and saltwater. By "dressed", SEBILE means that they've added a skirt to the trailer hook, and it makes the lure's visual volume bigger to increase the action and apparent size of the bait to the fish. On those rare yet vexing days when fish strike short or miss the hook, you'll find that the Dressed Trailer Hook is the perfect addition to the award-winning Pro-Shad Spinnerbait.MSRP: Pro-Shad Spinnerbait Trophy 28g 1 oz $17.00; 38g 1-3/8 oz $17.75.